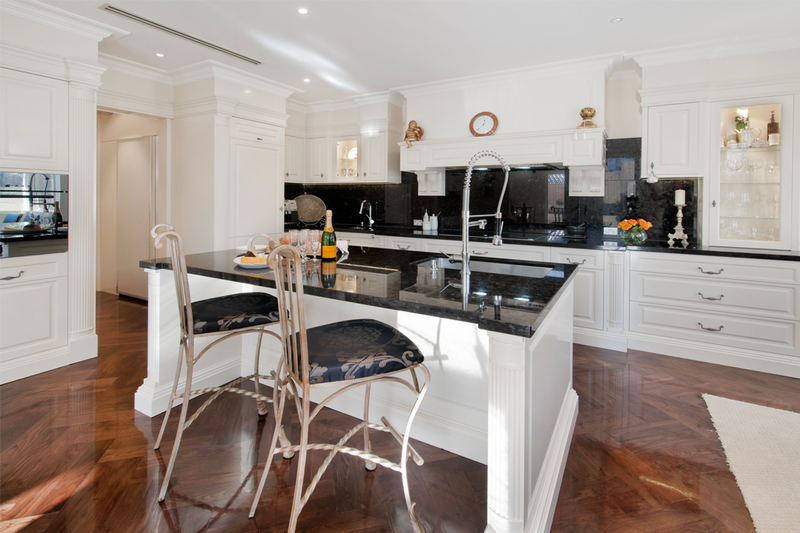 Established by Andrew Marangos in 1987, A.M. Kitchens’ work can be found in some of Melbourne’s most exceptional homes. A.M. Kitchens completes a range of styles, including classic designs with intricate details and sleek and modern projects, and works closely with its clients on every project. The company’s friendly team will combine each client’s ideas with its wealth of industry experience to create the best results every time. An example of the company’s fine work, the first kitchen featured is the embodiment of the homeowners’ desires. They wanted a space that was practical, could accommodate guests and was in keeping with the detailed aesthetic of the house. Featuring outstanding craftsmanship and maximum storage space, this stunning kitchen is a triumph of function and form. Paying close attention to the small details the experienced team at A.M. Kitchens was able to create a space that was both pleasing to the eye and contained multiple preparation areas without seeming cluttered – perfectly suiting the clients’ brief. The main features that contribute to this kitchen’s style and practicality are the sleek appliances – two side-by-side ovens – and the walk-in pantry, which creates a large amount of storage space and includes a sink, benchtop and extra preparation areas. The island benchtop within the kitchen makes tackling large cooking tasks a cinch, while the hand-crafted columns, kickboards and overhead pelmets add to the visual feast that is this kitchen. The second kitchen is a room unlike the former, and proves the company’s astonishing versatility. Featuring all the modern conveniences and stylish minimalist finishes, this unique space is a joy to use. Overhead cabinets including handy lift-up mechanisms make reaching for the top shelve an easy task, while the centrally located cooktop and oven leave plenty of room to move while preparing meals. Both kitchens illustrate the depth of A.M. Kitchens’ talent. With these two stylish kitchens, the friendly and experienced team has proven itself capable of creating exceptional spaces to suit any taste.